Even though it took us nearly 53 minutes to figure it out, we finally have our first touchdown of Super Bowl LIII. 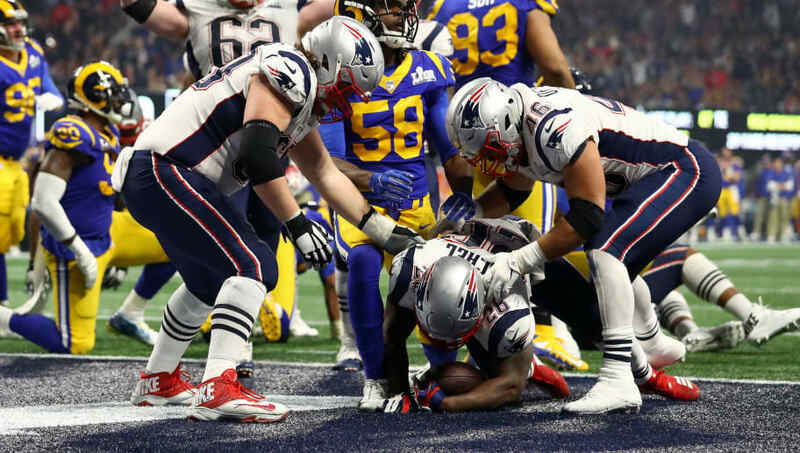 New England Patriots running back Sony Michel scored the first touchdown of the Super Bowl 53 matchup between the New England Patriots and the Los Angeles Rams. Michel found the end zone on a 2-yard rush, which gave Patriots the lead 10-3 lead in the fourth quarter. Who do you think will get the first TD in this year's game? We have Gurley and Michel as our favorites at 7-1 odds. According to FanDuel Sportsbook, Michel was listed at +700 odds to score the first touchdown of the game, so that's quite the return for his bettors. This late score also cashed tickets for bettors who took Michel to score a touchdown at any point in the game -- he was listed at -135 odds. Michel also became the second rookie in the last three decades to score a touchdown in the Super Bowl. This is only the 2nd ever #SuperBowl that's tied entering the 4th quarter (Patriots-Eagles in SB XXXIX). It's also the fewest combined points through 3 quarters of a #SuperBowl. Due to this majority-game scoring drought, the opening over/under total, via FanDuel Sportsbook, has dropped from 55.5 points at kickoff to as low as 16.5 points on a live betting line in the fourth quarter before his score.